"I Don't Like Whale Meat"
Japan has a big problem now. The present ruling party adopts the lefty policies. People who were angry with the economic policies of the Liberal Democratic Party (LDP, the former dominant party) had voted for the Democratic Party of Japan (DPJ) with intense disciplinary feeling in August. Consequently, the DPJ got the power. Moreover, the DPJ had taken other lefty parties into its regime. Now, the Prime Minister, Hatoyama, is repeating nonsense and anti-Japanese comments one after another. By the way, both Koreas and China has the tradition of eating dogs. They say that dogs are nutritious and nice to keep fit on a sweltering hot day. I imagine that dogs for them are just like eels for Japanese. I have a dog and I'm sorry to hear that, but it is their tradition. I have nothing to tell them. The title of this entry is Mr. Hatoyama's official words to foreign countries which accuse Japan of whale hunting. Japan has had the culture of utilizing whales not only as food but also daily necessities. Japanese people have never wasted them. The price of the meat had been lower than cows and pigs, and whale meat had been the food of ordinary people. Mr. Hatoyama was born into a very rich family that has produced famous politicians. I think he might not need to eat the whale meat. However, he is now the Prime Minister of Japan. He should not say so. I'm suspicious of his qualifications as The Prime Minister. Generally speaking, there are two types of medicine in Japan, though they were categorized into various groups by lots of viewpoints, in short western medicines and oriental medicines. I didn't learn any remedies by oriental medicines in my college days, because they were not acknowledged to be sufficiently effective. Only a few physicians used to believe in the effectiveness of them at that time. Originally, these medicines were developed in ancient China. Numerous plants, trees, stones, soils and animals were used as medicines, and those materials had been mixed or thrown away for a few thousands years. They were imported into Japan long ago and were developed individually by the efforts of Japanese researchers. You might be wondering why they hadn't been used in modern medicine. It's because they haven't any scientific evidence. They had been created through a trial and error process. I imagine that a huge number of people would have been killed in this process. In western countries, evidence is the key to medicine, and so this type of medicine hadn't been used. However, a famous medical journal, "Surgery", adopted a research paper about one of the Japanese herbal medicines several months ago and it was epoch-making. Boohuutuusyoosan in the title of this entry is well known and one of this kind. It is said to be able to remove excessive adipose tissue. I started a human experiment on me. Japanese herbal medicine is really mysterious. Do you know about the Greater East Asian War which Japan is supposed to have waged against the U.S. in 1945? You might wonder what "is supposed to" means. The Atlantic Charter was promulgated on Aug. 14th in 1941, just before the Greater East Asian War. In the pathway, then U.S. president, Franklin Delano Roosevelt and then prime minister of Great Britain, Sir Winston Leonard Spencer- Churchill had a talk on Aug. 10th and 11th on the battleship off Newfoundland in Canada. Both leaders are supposed to have reached an agreement that the U.S. would join World War Two from the backdoor. If you are intersted in this meeting, google for it with the keyword, backdoor, Churchill and Roosevelt and you'll know the opinions of lots of professional historians. The content of this meeting is still veiled in secrecy. If the record about this meeting was open to the public, you'd know who just wanted the war in the Pacific Ocean. By the way, I'll write about Kamikaze. It was the name of the suicide attack corps when the war was near its end. The chief pilot of the first attack team was a young man who had been born in Ehime Prefecture, where I live now. I'm so ashamed that I hadn't known about this hero until recent times. The pictures are of the ceremony in commemoration of him. I'm not going to praise the war in this blog, but the patriotism of the young pilots of the Kamikaze Special Attack Corps should be commemorated by all Japanese, but many Japanese reject it. I can easily imagine your doubtful looks. There would be no way in other countries. The Japanese spirits are getting rotten year by year. After the end of the Greater East Asian War, the coalition leader, Douglas MacArthur and other staff members of GHQ, made up the Japanese Constitution and gave the Japanese the wrong information that has pressed their case for the war. Their occupation policy was replaced by leftist groups and medias, including NHK, and most Japanese are still under the influence of the U.S.'s occupation at present. I was told that MacArthur was a nice man and gave us freedom and democracy, and lots of Japanese still believe it. However, remember the address by Martin Luther King, which is well known with the phrase "I Have a Dream". There was no democracy in the U.S. when the war ended, though Japan already had it. I'm now reading THE COLDEST WINTER by David Halberstam. MacArthur is vividly described in the book, and he doesn't look like what I was told. I'll write the book report later. The author, David Halberstam, is a great journalist and what he wrote is absolutely true, I believe. I joined a demonstration againt NHK today. It's the first time that I've attended such a social activity. Needless to say, NHK is the National Broadcasting Company of Japan. Despite the fact that NHK is run by Japanese public viewing fees, lots of their programs are distorted to comply with the Chinese Communists' Party's wishes. I had been putting up with them for a long time, but finally I lost my temper after watching the program that was aired this April, which went against the feelings of Taiwanese. Taiwan is the only state to love Japan in the world. Japan should never betray Taiwan again. The Chinese communists are longing to break up the good relationship between Taiwan and Japan, and send their agents into the NHK. This program must be what they had done. The composition of the program was elaborately built, and uninformed people would be easily deceived and believe the content. I'd have liked to make people awake to the delusive programs of NHK. On the other hand, more than ten thousand people, including me, filed a lawsuit against NHK in July. This is the biggest lawsuit in the history of Japan, but NHK hadn't aired this news until a few weeks ago. Also on this point, NHK can't be called an honest media outlet. I installed the ETC device on my scooter and at that time I wondered if the ETC was well known in the world. The ETC stands for "Electronic Toll Collection System." If a car was equipped with this device, the toll of the highways would be payed automatically by credit cards. You don't need to stop at the gate of the highways. It is supposed to contribute by suppressing the traffic jams. Especially in the case of motorcycles, the rider takes more time to pay the toll than the car drivers. He should take his gloves off and take his wallet out of his pocket and pay. After that he should do those reversely. I'm a happy camper to be free from this bother. My ETC device, to tell the truth, I don't know if this word is correct or not, but anyway this device communicates with the authority at the gate of the highways and informs them of the license number of my car. They calculate the toll from the information of the entrance and the exit and charge to my credit card. The antenna of the device is shown in the picture. A small black box attached to the wind screen of my scooter is it. 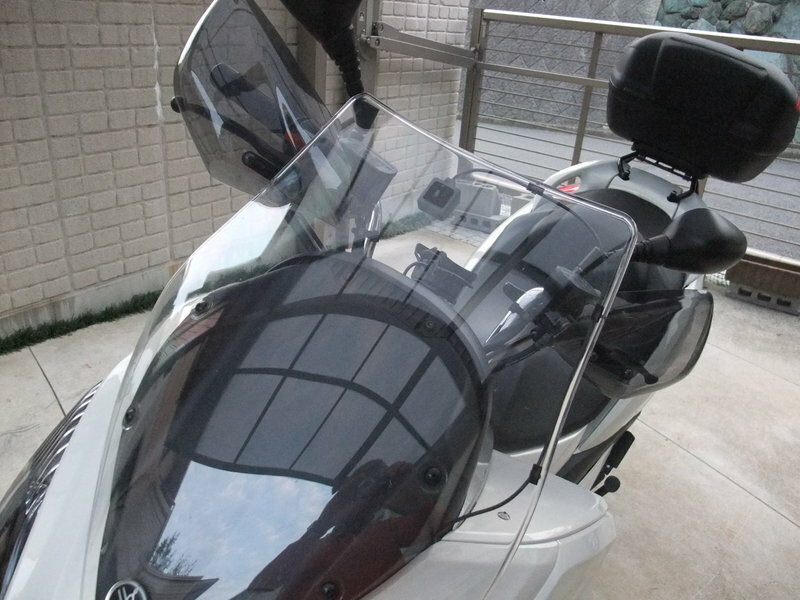 The main parts of the device is set inside of the scooter because of the security. I had a good impression about Germany through this trip, though I had visited only a part of its southern area. I looked for the reasons why I thought like that, and got to think as follows. At first, German people were kind and polite in general. I felt friendly toward them. Germany has its own long history and it was just like Japan. Streets were clean and it was safe. The punctuality of the German trains also surprised me. I didn't expect it before leaving Japan. I admit that I had watched only very restricted aspects of Germany, so my knowledge about Germany would be shallow or superficial. It made me think I've got to learn more about Germany. On the other hand, I had to buy mineral water in Germany. In Japan, I can drink the tap water. Additionally, there were few public toilets in the street. It was always distressing to me. However, I like Germany. I should have visited in my younger days. Now, I'm not sure, but Germany would be like Canada for me. I mean, when I was in Canada for my first visit, I got to love it, and finally I got to visit Whistler in Canada again and again. I would repeat visiting Germany from now. Now, let's start adding to my German vocabulary. I could hardly see the earth on the outbound way to Germany due to thick clouds, though outside was always daytime for the twelve hours of flight. I've never been to China, Mongolia, Russia, etc. In short, I haven't been to any of the countries but South Korea on the Eurasia. I really wanted to see the land from the plane, but couldn't. As for the return flight, we would go through the short night time zone around Siberia. I didn't expect anything about the scenery from the window. However, I could see the lights of Irkutsk and the dark blue and mysterious surface of Lake Baikal under the full moon. I'll show you two pictures of Irkutsk first. I met the rising sun when the plane was just going out of China into the Yellow Sea. The earth had a specific terrain so that you would find where it was. The next two bright pictures were of the Incheon International Airport. I had landed at this airport last March and I remembered it. In the next picture, Han River, which runs through Seoul City, and Imjin River, which separates North and South Korea, merges at under the Odusan Unification Observatory by which I had passed this March. I wrote about this observatory here. The last three pictures are of Han River in the center of Seoul City, which divided into three parts. I could detect the hotel that I had stayed at in March. As I wrote in the previous entry, I had to kill time at the boarding gate. I was taking pictures of our airplane. After the loading of meals and drinks, the stowage of the baggage began just in front of me. At that time, a staff member of the airport stopped his towing carts and opened the door of a cart. He started taking the baggage out of the cart. What? When I was gazing at him, several people noticed him and got together around me. What's happening? Someone told us that the authorities must have received a bomb warning or something like that. He was apparently joking, but a lady was really angry at him. I got a scare, not from the bomb story, but from her acid words. At the same time, I thought that the words that came out of the mouth with strong breath were just like what the pronunciation should be. The pronunciation of Japanese people is completely the contrary. What I mean is, as Japanese people talk they don't exhale strongly. I think this is one of the reasons why most Japanese aren't good at speaking English. Anyway, the airport's official took two bags out of his cart and put the other baggage back. Flight meals of the return flight were also as good as outward. I'm not sure now, but I would probably choose Lufthansa if they have a flight to the place I want to go. We stayed at the Sheraton Frankfurt Hotel & Towers last night. This hotel was really good. We were lucky to stay here at a reasonable price because the day was in the discount period. The breakfast was included in the room price and it was also really good. I took some pictures of the airport from our room and I found that the airport was under renovation. I heard from my wife that Frankfurt airport was huge and clean. It looked like she liked this airport, but I didn't. When we got to the airport for the first time a week ago, we couldn't reach the baggage claim smoothly. Moreover, it took some time to find our hotel yesterday, because of few signboards. It might be due to the temporal renovation, but the airport was in a jumble. I'd like to say one more thing. There were only a few duty-free shops after going out of the country. I thought I would get several souvenirs and also do some window-shopping here, but I couldn't and I had too much time to kill at a time. Just before getting on board, I put new batteries into my data logger, which would record our track. It would make it easy to detect the point of the pictures through the window. The route that we flew is processed and is on the internet linked from Today's Route above. We just wandered around the Old City, looking for a nice place for dinner. The first picture is of the opera house that we found by chance. It looked like it had a long history and I hoped that I would enjoy an opera there someday. The next two pictures are of the shops that engaged Yuri's interest. She is 21 years old, but looked like a low teen. She was looking for candies for her sisters in the pictures. While I laughed at her saying "You look like an ant that gathers around sweets", I was told that the things in the pictures were like a magnet for me. Actually I was interested in how to adjust the power of charcoal fires on the barbecue in the next two pictures and I was gazing at it for more than ten minutes. Someone might be wondering if I was a beggar or someone who was hungry at that time. Anyway, the barbecue man was moving the grill up and down, and sometimes rotating it. It was a nice idea. We had various kinds of food from street stalls tonight. I looked for the domestic dish, 'wiener schnitzel', but couldn't find it. I'll try next time. The man in the last picture also attracted me. It was really the country of sausages as might be expected. The tourists' attraction that I most wanted to visit in Frankfurt was the Goethe Museum. Needless to say, he is one of the most known authors in the world. I reserved a half day in Frankfurt for it. I heard that the museum was modified from his real residence and his daily life was well reserved in it and so, I expected that the museum would be a huge building next to his original house. However, the museum wasn't so famous in the neighborhood. We asked the people in the street how to get to there, but there were few who could answer us accurately and properly. We managed to get there, but almost passed by it. The museum was very low-profile. As you can see in the picture, the signboard was so small. The museum was his original house itself. Because I thought that the museum had been newly built adjacent to his original house in commemoration of him, I was surprised that the museum was his original house itself. In the museum, old things that he or his family actually used were preserved, but flash photography wasn't allowed in the museum, so most of my pictures were out of focus. I'll show you some pictures that were shot well by the sunlight. There was a room that was told to be the room where he was born. The house was four or five stories tall, and he seemed to be born into a rich family. The pictures of the airport were shot from our room. Our hotel is noted as a luxurious one in the world, but the day we stayed was at a discount rate and the room fare was reasonable. We were really lucky. We decided to enjoy the last German night in the Old City of Frankfurt and went out, though it was already past three o'clock in the afternoon. The statue of Friedrich Schiller is in the picture. When I was a medical student, I had joined the orchestra and sung his words, Ode to Joy. I recalled and sang a part of his words here and was able to surprise Yuri. I think that the mysterious aspects of fathers seem to be a magnet for children. As I wrote here in this blog, Yuri hadn't known until recent times that I had learned German long ago. I couldn't communicate with Germans sufficiently now, but could read the words on signboards. I was happy and comfortable to see her eyes that admired me. I have already decided to give up visiting Canada this season. I was going to visit during the Olympic Games, but I'm thinking of visiting southern Germany next March again. I'm brushing up my conversation skills by then. One of the annoying aspects of this trip was that there were few toilets in the street. We used the toilet in the station out of curiosity just before our departure though I knew there was one in the train. The picuture is of the toilet under renovation. You need 80 cents to use it. I got a kick out of "center" on the sign at the entrance. What did it mean? I thought that only "WC" was enough. By the way, we got on ICE 74 that started at 11:49, and the itinerary was in the second picture. All the stations that this train would stop at were ones that I knew. I really wanted to visit them and the train would go to Kiel that is noted as the site of the sailors' mutiny that sparked the German Revolution in late 1918, just before the end of World War One. There must be historic monuments around the city. We took seats in the first class on the return journey for fun. I was going to have lunch in the buffet, but it was crowded and I gave up. The cup in the picture was delivered by a staff member from the buffet. A coffee was offered at a reasonable price in our own seats. Our seats were at the side of the column between the windows and were rear-facing. In the Shinkansen, the Japanese superexpress, passengers can change the direction of the seats as they like, but I couldn't in the ICE. It was really uncomfortable. Additionally the data logger couldn't catch the wave from the GPS satellites. Consequently, today's route was incomplete. however, luckily, the passengers behind us got off at Karlsruhe and I moved to the seat where they were sitting and could take some pictures. Nevertheless, the data logger didn't work either. It has to detect its own position at first, but it couldn't because of the high speed of the ICE. I noticed the red point on the window glass. It was for taking off the glass in case of emergencies. At first I thought that a man had to break the glass with the red hammer-like staff with brute force, but it looked like it worked electrically. We were going to get off the train at Frankfort Airport, but the travel agent made a mistake in the reservation of the train, and our train didn't stop at the airport and we had to go to Frankfort and come back to the airport. The last picture is of the signboard at the entrance of the coach. It looked like this train would also stop at Hannover and Hamburg before Kiel. As I wrote before, train trips in Europe must be fun. As soon as we checked in the Sheraton Frankfurt Hotel & Towers at the airport, we went out to the Old City of Frankfort for sightseeing. We got up about 7:30 and checked out of the hotel at 9:30 after the fourth time of having the same breakfast in this hotel. Yuri wanted to call in at the souvenir shop in the Old City that was closed when we visited it last night. She found something inside the window last night. Though I had no plan today, I couldn't leave her alone and followed her. We had been staying in Freiburg for several days, but it was the first time we'd walked in the Old City in the morning, and so I was surprised to see the open space around the Cathedral. It had become a big bustling market. I'll show you some pictures and write some remarks. Bread is called "Brot" in German. The first picture was of a movable bakery shop and there were many types of bread that I had never seen. At the meat shop in the second picture, I found many kinds of sausages and something smoked. There is no sea around Freiburg, but there were fishes. Cheese was sold sliced and I'd never seen such a big block of cheese. If I could visit this city again, I'd prefer a condominium-like place rather than the usual hotels and would cook using these domestic materials. Whenever we visit Whistler in Canada, our ski trip is always like that. I had been eating different sausages every day there, but I hadn't completed all the different kinds of sausages in the market. Are there any condominiums in Freiburg?